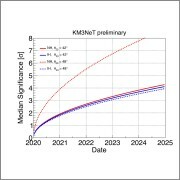 Another goal of the KM3NeT scientists is to study the properties of the neutrino particle themselves. For this, they will use the ORCA detector of KM3NeT which is optimised for the study of neutrinos created by cosmic rays in the Earth’s atmosphere. ORCA stands for Oscillation Research with Cosmics in the Abyss. With the ORCA detector the KM3NeT scientists will study fundamental properties of neutrinos, exploiting the abundant fluxes of neutrinos produced in the interactions of cosmic rays with the Earth’s atmosphere.The atmospheric flux of neutrinos has traditionally been seen as a background to the detection of a cosmic neutrino signal. However, in recent years it has been realised that in the few-GeV energy range, this flux holds the key to resolving a fundamental question of particle physics: that of the relative ordering of the neutrino masses, also referred to as the neutrino mass hierarchy – i.e. the question whether the third neutrino mass eigenstate is heavier (normal hierarchy) or lighter (inverted hierarchy) than the first and second states. The influence of the mass hierarchy on neutrino oscillations in matter leaves its imprint on the atmospheric neutrino flux via the characteristic appearance/disappearance patterns of the different neutrino flavours as a function of energy and path through the Earth. Deployed at the KM3NeT-Fr installation site about 40 km off-shore Toulon, France, the ORCA neutrino detector will take advantage of the excellent optical properties of deep sea water to achieve the angular and energy resolutions required for resolving the neutrino mass hierarchy. A multi-megaton scale array of KM3NeT light sensor modules will be used with a granularity optimised for studying reactions of atmospheric neutrinos with the seawater. The sensor modules will be arranged on vertical detection units with a height of about 150 m and in the dense configuration required for detection of neutrinos with energies as low as about a GeV, three orders of magnitude lower that the typical energy scale probed by the detector of the ARCA telescope for neutrino astroparticle physics. The construction of ORCA will proceed in phases to adapt to available funding. The first phase of construction of ORCA has started and forsees in a prototype array comprising 6 vertical detection units with a horizontal spacing of about 20 m. In the next construction phase of KM3NeT 2.0, the full ORCA detector comprising a detector block of 115 detection units. The ORCA detector will have a total instrumented volume of about 3.7 Mton of sea water, thus providing new opportunities for neutrino oscillation studies in the Mediterranean, complementary to those using reactor and neutrino beam experiments. 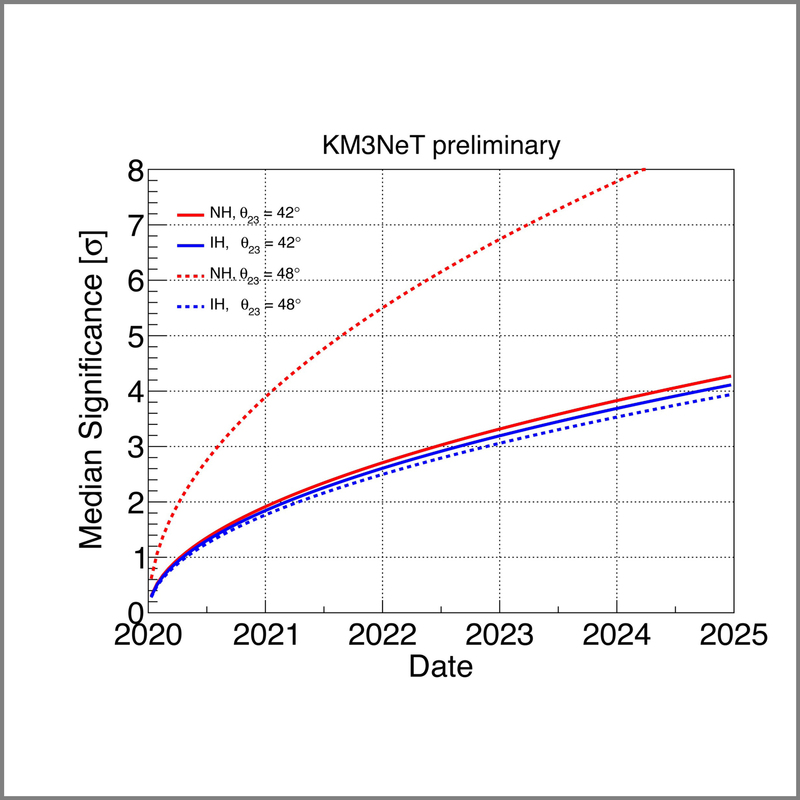 Currently, the implementation of the full KM3NeT 2.0 configuration is partially funded.